When I announced The Colette Sewing Handbook, one of the first things you guys asked for was a preview of the five patterns it contains. I am more than happy to oblige. I’ve planned a series of posts showcasing the designs, with a little background info and even a few outtake photos that don’t appear in the book. For the book, I had the usual goal of designing patterns that are simple, beautiful, and versatile. I pretty much always have that goal. But I also wanted these patterns to be good teaching instruments. They are integrated with the techniques in the book, so that you can practice various lessons in a really hands on way and still make something you actually want to wear. Taffy actually comes toward the end of the book, in the chapter on finishing. Among other things, with Taffy you get to practice sewing darts, making your own bias tape, sewing French seams, and binding edges with bias tape. A handy skills checklist at the beginning of the pattern gives you the page numbers of all these techniques (and more). Taffy is a floaty little blouse, cut on the bias so you don’t need closures. You can make it in a sheer fabric if you want, because the edges are all neatly enclosed in French seams, or bound with bias tape. The bias tape adds a fun design detail, but it also makes it much easier to finish the edges of the curved sleeves. No fussing with deeply curved hems, even with these circular sleeves. This is a great technique you can take to pretty much any curved hem. Taffy is only made up of three pattern pieces. That means you spend your energy on the fine finishing details, not hours cutting. 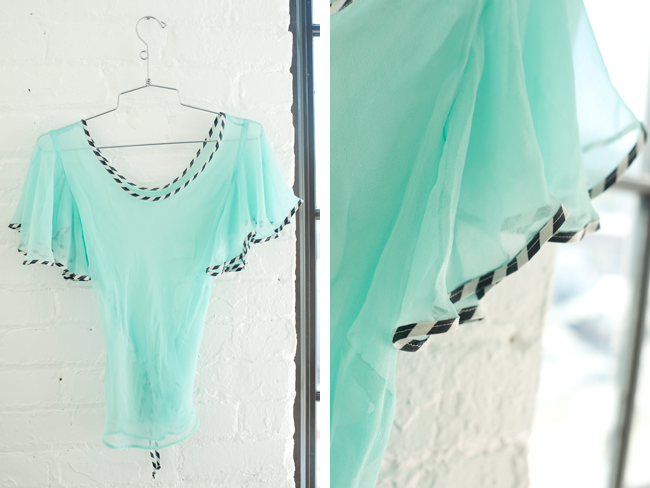 We made the book sample in a bright aqua chiffon, but you could use just about any lightweight, drapey fabric. Lawn, georgette, voile, or crepe would all be lovely choices. For the bias tape, believe it or not, I made it out of an old black and white striped silk shirt! That’s one of the awesome things about making bias tape, you can make it out of small amounts of fabric and even old thrifted clothes! Meringue is the first real project in the book, so it’s made to be quite simple, with the emphasis on using patterns properly and trying some different techniques for transferring markings. Obviously, the cut is very simple. There isn’t even a waistband to sew. The fun is all in the scalloped hem, where you have a chance to try pivoting corners, notching curves, grading seams, and sewing a catchstitch by hand. This is an easy-peasy pattern with a really eye-catching result. We used a striped cotton twill here, and a solid cotton twill for the black version above. This skirt works beautifully in both prints and solids, is quick to sew, and pretty much always looks adorable. Stay tuned for another preview next week, guys! 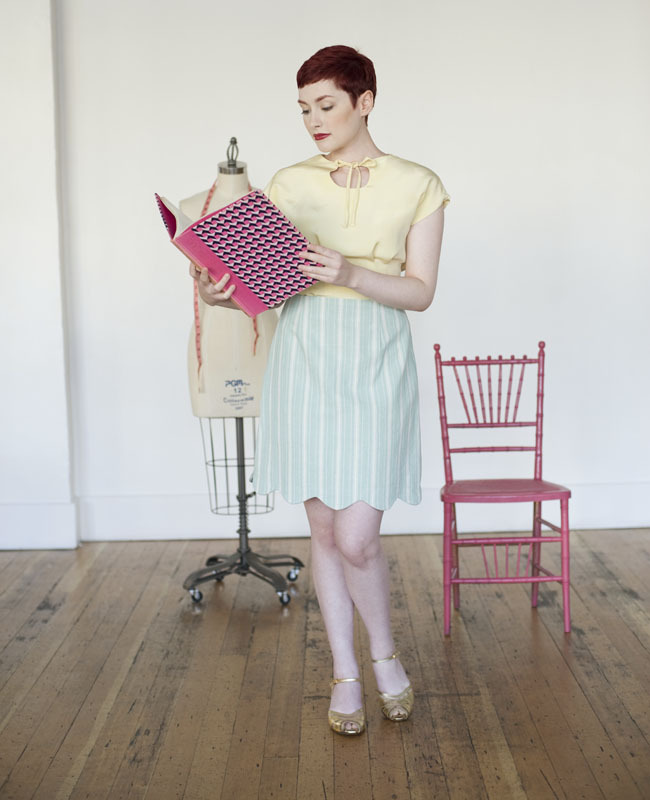 And of course you can buy The Colette Sewing Handbook on from our shop right now! Announcing The Colette Sewing Handbook: Read all about the book on my initial announcement post! How the book was hatched: All about the concept and how it came to be. Help spread the word: A few things you can do to help me get the word out about the book. Oh wow. I LOVE that blouse. It’s so pretty. Looks like I’m pre-ordering the book if only to get that pattern! Such a beautiful top, it will be perfect for Summer and I love the scalloped skirt too. I can’t believe that there are five patterns with the book. I am waiting impatiently!! I am loving these! I have fabric for them both and just itching to create! I love all the inspiration I am seeing so far! Keep it coming! My book is pre-ordered, and I just can’t wait to get it! I don’t think I can wait til Christmas! I LOVE the patterns in the preview here, and I love all of the Collette patterns I’ve tried so far. I anticipate reading the book cover to cover, even if only to reinforce my understanding of techniques, to learn new techniques, and to find new and better ways to do some things. I really can’t wait! I’m really excited about the patterns too!! They’re both very pretty. I’m so excited about this book! I can’t wait for this book! It’s already on my Christmas list :) I have a feeling these patterns will inspire a new spring wardrobe. Thanks for the preview – keep them coming! I just adore the blouse! I see it for holiday festivities or casual spring. So glad I pre-ordered so I can see this asap. The blouse is super cute. It looks like something I could make and is something I would definitely wear. oh I love them! I can’t wait to get my hands on the book, I’m already having visions of dressing Taffy up and down and don’t even get me started on the outfit dreams I’m having involving Meringue! I am so happy that I pre-ordered the book! I am new to Collette patterns so the book will have my first patterns. My only concern has been whether or not I will find patterns in the book that I feel I can adapt for myself, a more mature woman. I already have confidence that I will be able to gain better sewing skills while I am actually being able to make clothes for myself (as opposed to baby clothes) with these to previewed patterns. Wow! They are both so visually stunning ! It is almost hard to believe they are simple! I can’t wait to make them both up! Ohmigosh!! Thank you so much! I pre-ordered mine the day you announced the book and I am so super excited to get started on these! You are such an inspiration Sarai! I cannot wait for this book. I will be found this winter sewing all your beautiful designs. My goal is that my friends both in Louisiana and Colorado will become sewers. I am so glad that this is on my Christmas wish list with my husband. Books are easy for him to pick up and he likes encouraging my sewing habit so this was win-win. Thanks for the previews, it’s going to be so hard to wait! Thanks for the previews! Your description and pictures have gotten me all excited. I’m joining everyone else and putting your book on my Christmas list! Nice, can’t wait to receive my preordered book from Amazon! i love the taffy top! i’ve ordered one copy of the book for myself and another for my lovely sister for christmas. can’t wait! Thank you so much Sarai, I was waiting for this! I’m looking forward to see the next post already! Oh, wow. How gorgeous. Original. Cool. How can I wait another two months? I thought the pale yellow blouse on the flyer worn with Meringue was the pattern in the book – now I realise it’s Sencha. Have just realised I need that pattern also. I am beginning to feel like I might as well buy all your patterns as bit by bit they are all ending up in my pattern bag! I can’t wait for the book. It’s on the Christmas list, although I think some people may need reminding!! The Taffy blouse is so simple and elegant, and the biased edging opens up all sorts of ideas! Love them! I was already planning to buy the book, and I am extra excited now! I adore the Taffy blouse, so my style and I can think of so many variations. Can’t wait to see the other patterns. Are you from the East side? I think I recognize the model! She models for Gudrun, too? Yep, I live and work in SE! I’m not sure which of the ladies you mean, but they both do model around town. The bias tape from a salvaged shirt is brilliant…You can also buy bias tape in a myriad of prints at Vogue Fabrics if you don’t want to make your own…My favorite right now is a red and white gingham on the shelf at Vogue…A bazillion ways to use that! Ooh, thanks, I will check that out! Yes, our base size is drafted for a C cup bust. Thanks Sarai. I’m between B and C so I’ll see how it goes. I have been sewing for 40 years. I took my first class at a Singer sewing machine and fabric shop in San Antonio, Texas. I have sewn countless patterns over the years and I have to say that your designs far outshine anything else I’ve seen. And I love they way the patterns come in a little booklet. I can’t wait for your book. Thank you, your designs are fresh and beautiful. Awww… Elaine, thank you so much! I can’t wait for the book to come out! Today I bought the perfect sheer fabric to make Taffy (brown with pale pink dots). The meringue skirt is fun and flirty. The pattern fits well, I only had to bring in the waist 3/8″ for a size 10. I found that understitiching from the wrong side helped getting the scallops just right.